I never thought we’d end up with three separate reviews covering the Kaoko throttle control — or cruise control, as it’s called by the manufacturer. (Actually, I’d call a true cruise control as a device that automatically adjusts to keep the speed constant; the Kaoko doesn’t do that, it’s a throttle position holding device. But I digress…). This time, we’re taking a quick look at the Kaoko throttle control designed for use with hand guards. 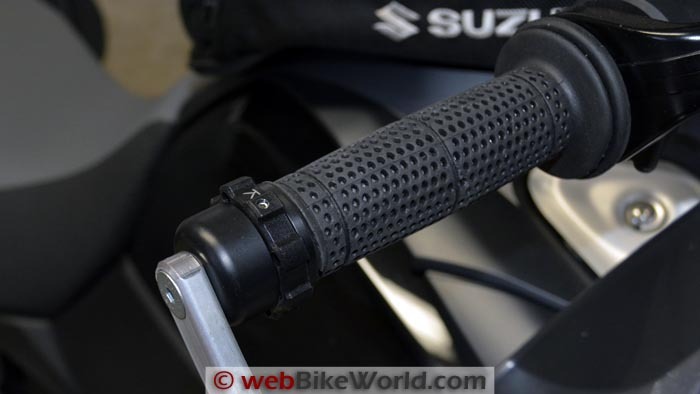 I had been using the Kaoko throttle control on the Suzuki V-Strom 1000 ABS (Blog); it’s a purposeful device that is barely noticeable as an accessory but works well. 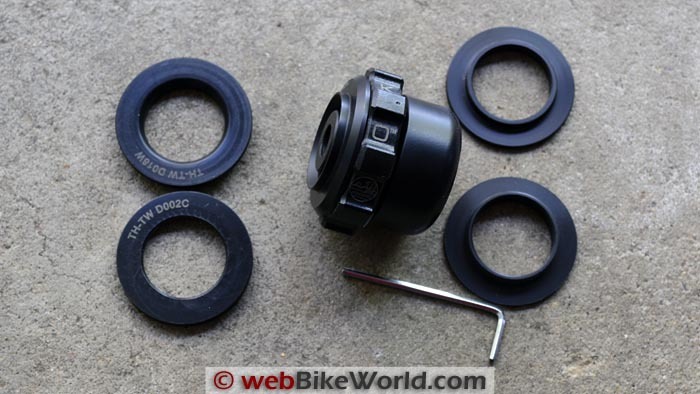 When I installed the Barkbusters Storm hand guards (review) recently on the V-Strom, I found that if I removed the bar end weight from the Kaoko VS1000UW-S and inserted one of the 20 mm spacers that came with the Barkbusters Blizzard hand guards (review), the Kaoko seemed to work. The spacer was just long enough to keep the inside of the hand guard backbone from pressing against the rotating part of the Kaoko, which allowed a throttle position to be set. But — and this is important — the inside of the VS1000UW-S Kaoko has only a tiny 1 mm step that was holding the shoulder of the spacer. This means that if the bolt for the hand guards was too tight and/or with some wear over time, the hand guard would press against the throttle control, potentially locking the throttle in an open position. Not something you’d want to have happen! So what’s the solution? Buy the correct Kaoko cruise control. It’s part number KBB200 for the V-Strom. It was specifically designed by Kaoko and Barkbusters by sharing design data in a combined effort specifically for this application. The KBB200 Kaoko is specifically designed to be used with Barkbusters and other hand guards. Besides the different configuration, it uses specially designed thrust washers and it also has the correct size bolt, which my cobbed-together experiment using Blizzard parts did not. Bottom line is that there are enough changes to the KBB200 that make it important to use this version if your bike has hand guards. 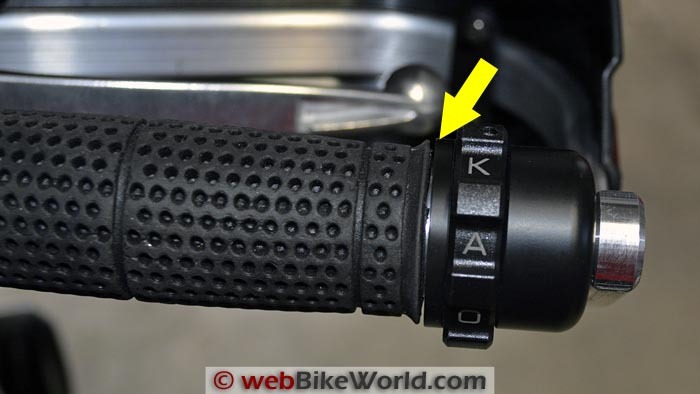 I won’t go into the Kaoko installation again because we’ve done that twice already, so please refer to the original Kaoko Throttle Control review or Installing the Kaoko Throttle Control on the Suzuki V-Strom (without hand guards). This is the Kaoko KBB200 kit for use with Barkbusters and other hand guards. Note the thrust washer selection. 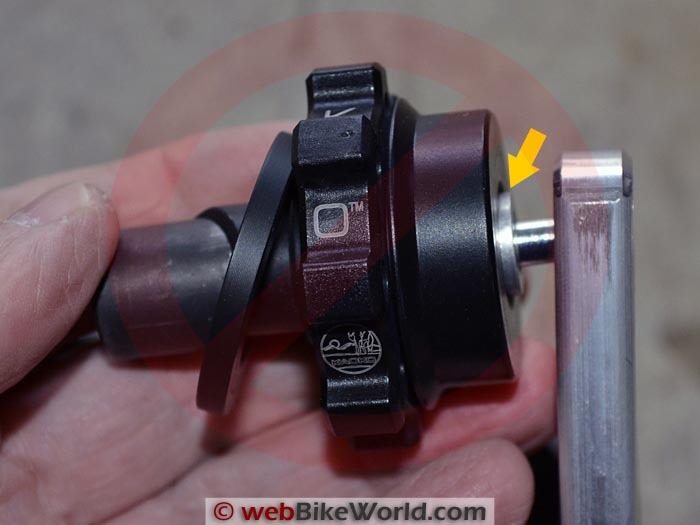 This is the modified Kaoko VS1000UW-S I originall installed on the V-Strom. Note the spacer from the Barkbusters Blizzard kit. The spacer can eventually wear and the shoulder inside the VS1000UW-S is not designed for holding the pressure of a spacer. Get the correct Kaoko if you’re using hand guards. Close-up of the Kaoko KBB200 with the correct thrust washer (TH-TW D002C) for the DL650 and DL1000. It uses the Barkbusters expansion collar. 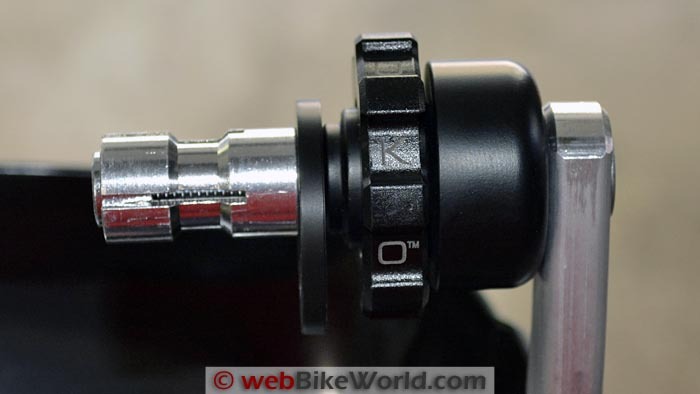 Make sure there’s enough clearance between the throttle tube and hand grip and the Kaoko. Correctly installed Kaoko KBB200 with the Barkbusters hand guards. The Kaoko cruise control or throttle control is a quality device that works well. But anything that has to do with throttle control needs to be considered with caution, so it’s important to buy the correct Kaoko for your application. List Price (2015): $126.99 to $144.99 (here), varies by make and model. From “B.K.” (December 2015): “Just wanted to say thanks for the write-up! It proved very helpful. My installation is the same: Kaoko KBB200 Rev1 and Barkbusters BB.BHG46.3.SBK on a 2014 V-Strom DL1000A. The issue I had — which was resolved by looking at your photos — was that of the five included thrust washers, only one had a visible part number. I had no idea how to determine which thrust washer was TH-TW D002C. By referencing your photos, I was able to determine that the correct thrust washer for the Strom 1000 is the only thrust washer that has no protruding lip. It is the one with a recessed groove. Also, I didn’t see anything in either set of instructions that said to omit the spacer (included with the Barkbusters) when installing the right ride hand guard with the Kaoko. The spacer physically would not fit on the included bolt (the bolt is too short). From “M.H.” (March 2015): “I learned the hard way that the Kaoko unit will not fit if you have Heli Bars (review) installed. I ordered the standard model to fit an 08 Honda VFR 800 and struggled to get in into the bar before the silly bugger light illuminated and I remembered that I had replaced the OE bars. When I contacted Kaoko they acted like I was the first person on the planet to encounter this situation, which I find hard to believe. I went out of my way to get them the ID/OD of the Heli Bars and was promised that they would do some research and provide the PN which could be used as a suitable substitute. Never heard back, so I returned the unit to the distributor and got my money back.